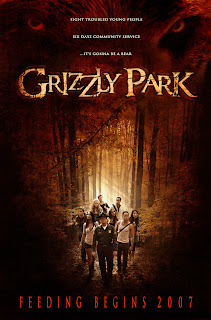 Check out Grizzly Park on Chiller, Tuesday Night! If you never got a chance to see Grizzly Park, now is your chance! It will be showing on the tv channel Chiller Tuesday night! You have 3 chances to catch it, at 4pm, 8pm, and midnight (Pacific time). Grizzly Park is the story of eight troubled young adults fulfilling community service in the woods of California. But they aren't alone. A hungry grizzly bear and serial killer are also on the loose.